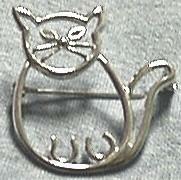 Sterling Silver Eyeglass Holder Brooch. Useful Elegance In the Shape Of A Cat. This Eyeglass-Brooch Must Have Been Conceived by a Business Woman. One Who is Accustomed to Combine Logical Efficiency ... With a Touch of Class and Style! Entirely Made With Sterling Silver, This CAT-Brooch is Large Enough to be Noticed and Small Enough to be Tastefully Comfortable. 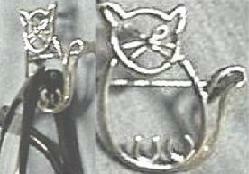 The Pin is Also Made with Sterling Silver and Has a Lockable Safety Clasp. The "Back" Side is as Equally Well Finished as the Front (Showing a Quality of Workmanship That's Typical of Designer's Jewelry). On the Back Side are Also Found the Signature and the .925/Silver Denomination Mark. Approx. 38mm High (Ears to Bottom). Approx. 34mm at the Widest Point. Approx. 24mm Wide (Excluding the Tail). Approx. 34mm High (Excluding the Ears).